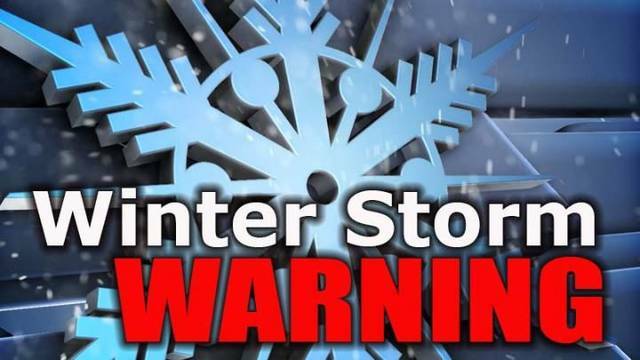 GALION — The National Weather Service has issued a Winter Storm Warning for this area. It starts at midnight tonight and runs through 10 a.m. Sunday. Total snow accumulations of 6 to 9 inches are expected, accompanied by winds gusting as high as 35 mph. This warning is for Crawford, Marion, Morrow, Holmes, Knox, Stark and Mahoning counties. Heaviest snow will fall from late morning into the early evening on Saturday. Travel could be very difficult. Blowing and drifting snow will develop in the afternoon. A Winter Storm Warning for snow means severe winter weather conditions will make travel very hazardous or impossible. If you must travel, keep an extra flashlight, food and water in your vehicle in case of an emergency. The latest road conditions can be obtained from the Department of Transportation web site. These levels pertain to all roads in Crawford County unless otherwise indicated. Level 1 – Snow Alert: Roads are hazardous with blowing and drifting snow. Roads are also icy. Drive with caution. Level 2 – Snow Advisory: Roads are hazardous with blowing and drifting snow. Only those who deem it necessary to drive should be out on the roadways. Contact your employer to see if you should report to work. Level 3 – Snow Emergency: All roads are closed to non-emergency personnel. No one should be out during these conditions unless it is absolutely necessary to travel. Employees should contact their employer to see if they should report to work. All non-emergency and non-essential personnel traveling during a Level 3 snow emergency may be subject to prosecution under Ohio Revised Code section 2917.13 for misconduct at an emergency.